Vendor Remarks: “A beautiful bride looks longingly at the photos she holds in her locket, the photos of her grandparents who couldn’t be there to celebrate this momentous occasion. She reflects back on her family, a musical lineage of great artists, with poise, love, and passion. As an homage, she incorporates the musical heritage of generations into the setting for her wedding day. 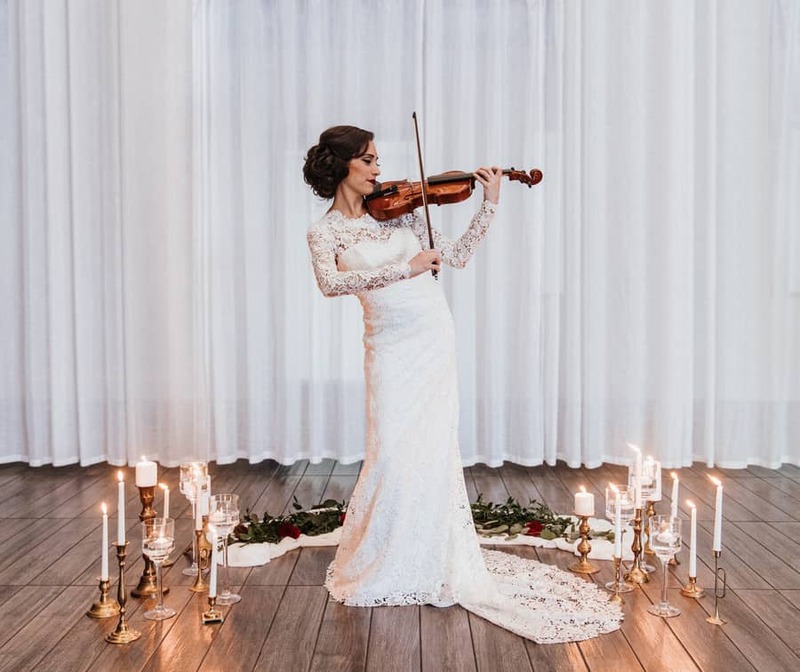 When old world classical music meets a modern day bride, adding in a simple and refined setting with vintage elements results in a stunning feast for the eyes. 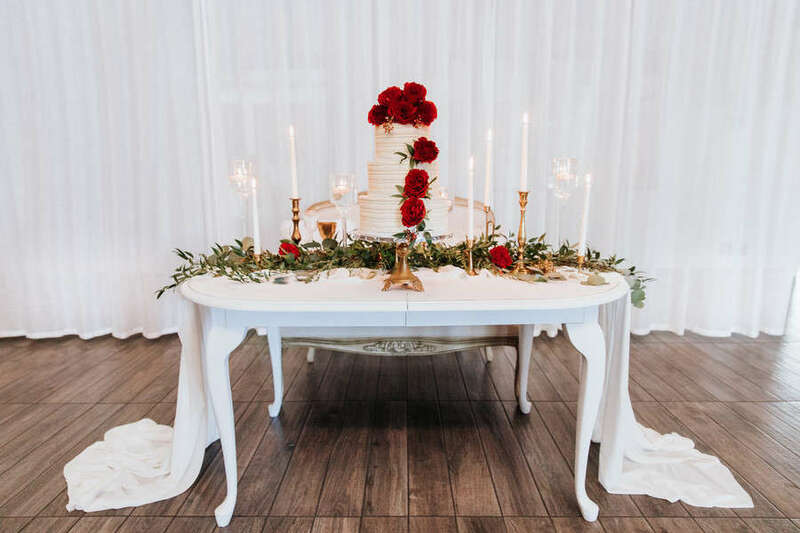 “This styled shoot aimed to combine the two worlds of vintage and modern romance mixed with little nods to classical music. 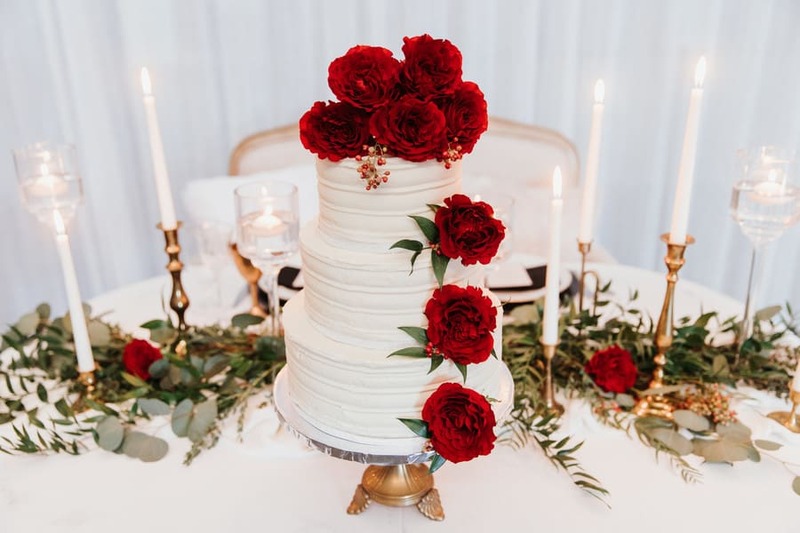 Created by wedding planner and board-certified couples’ music therapist Carina Inganamort, of The Wedding Therapist, the vision was only realized with the works of many talented Arizona vendors. Showcasing the space of local up-and-coming wedding venue because Event Space was an easy choice because of its sleek design, accessibility, and touch of delicate antiques to create the mood. 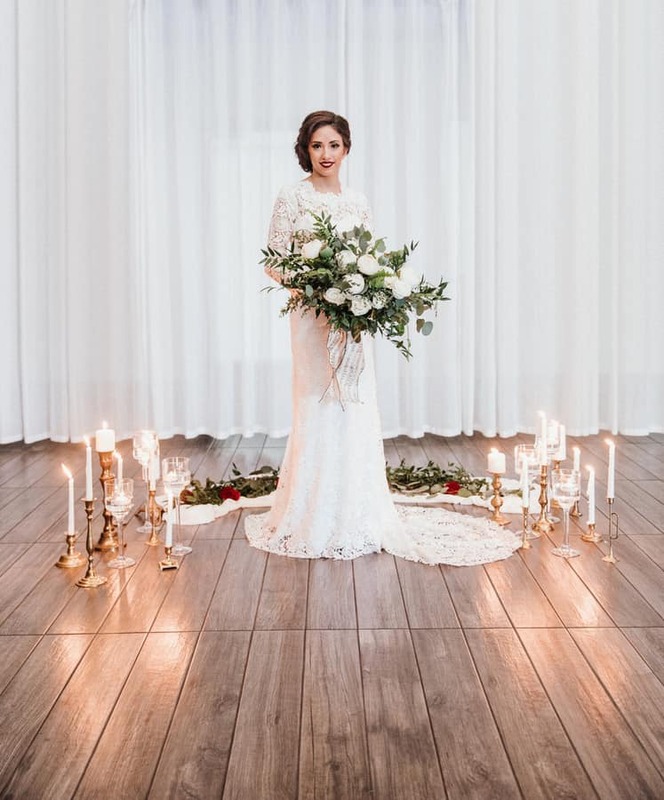 Their “Original” space is filled with natural light, high ceilings, and delicate floor-to-ceiling curtains which reflect the laid back and elegant simplicity that many modern brides seek. “We filled the space with unique yet stylish pieces from Vintage Chic Rentals, right down to the brass trumpet candlestick holders. 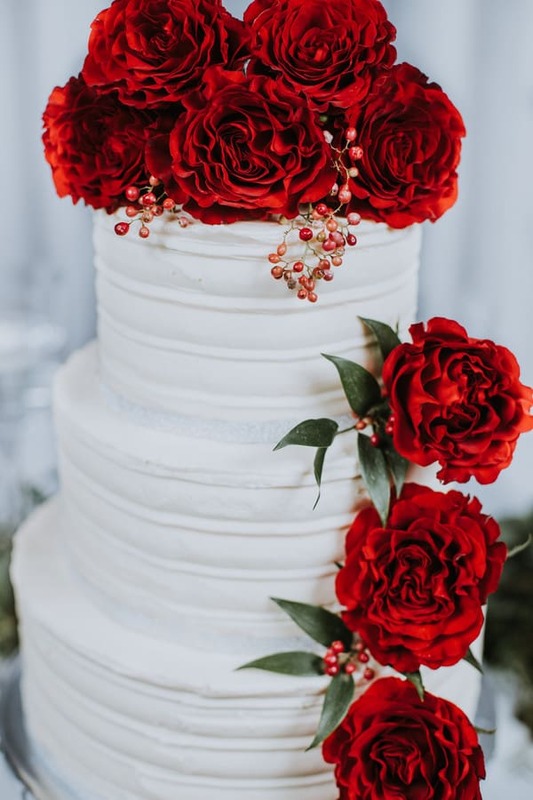 Pulling in a palette of creams, whites, and golds laid a fresh and romantic canvas for the eye-popping red touches in the flowers and makeup. 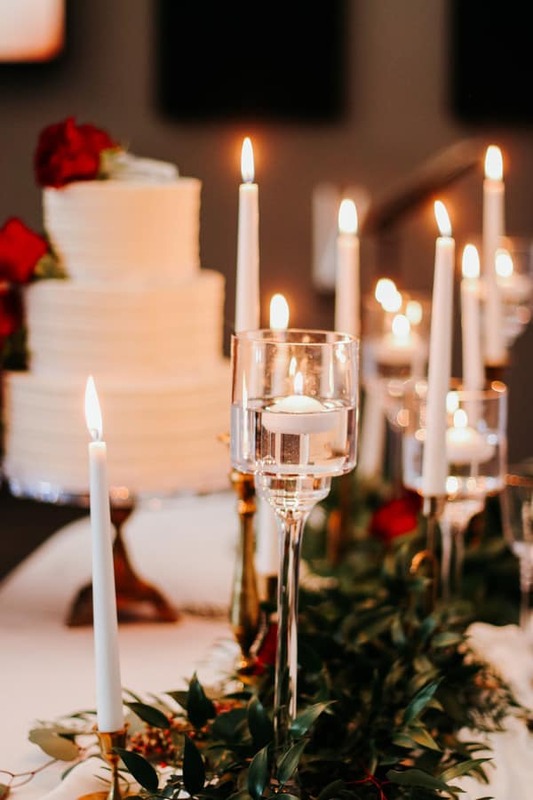 Bringing in oodles of soft candle light mixed with fun, modern accents like black chargers old-rimmed glasses a brass arch, and tall glass votives, perfectly captured the cross-century vibe. 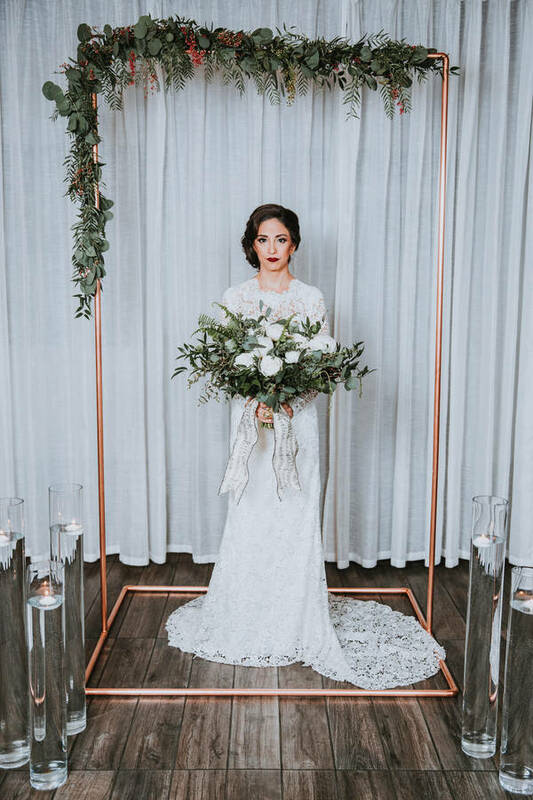 The table was hand-finished by Amanda herself and looked stunning with a timeless neutral tufted bench and draped with beige chiffon and a garland from Anna of Fleurt Floral Art. 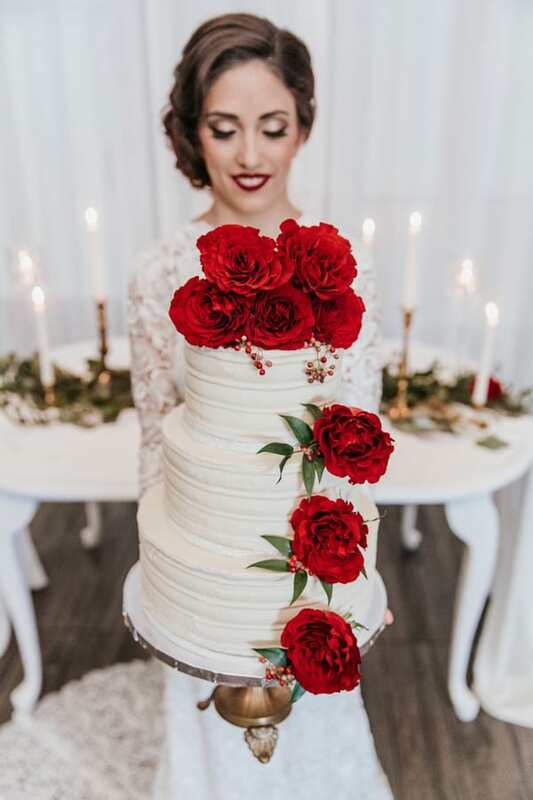 A classic white cake from Silver Rose Bakery looked stunning studded with Anna’s rose buds. 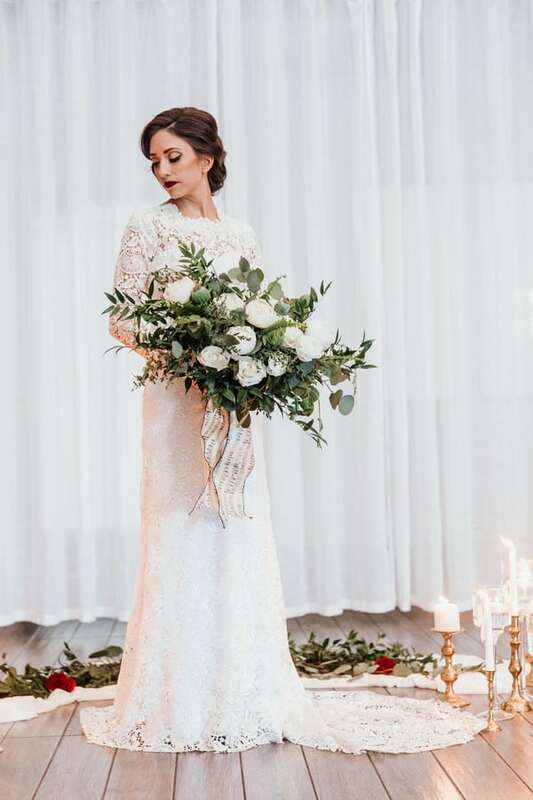 “Enter: the stunning bride, model Rebecca Warshawsky, perfectly poised in her Melissa Sweet lace gown, made over with the transformative talents of Katie from Hairpin Collective. 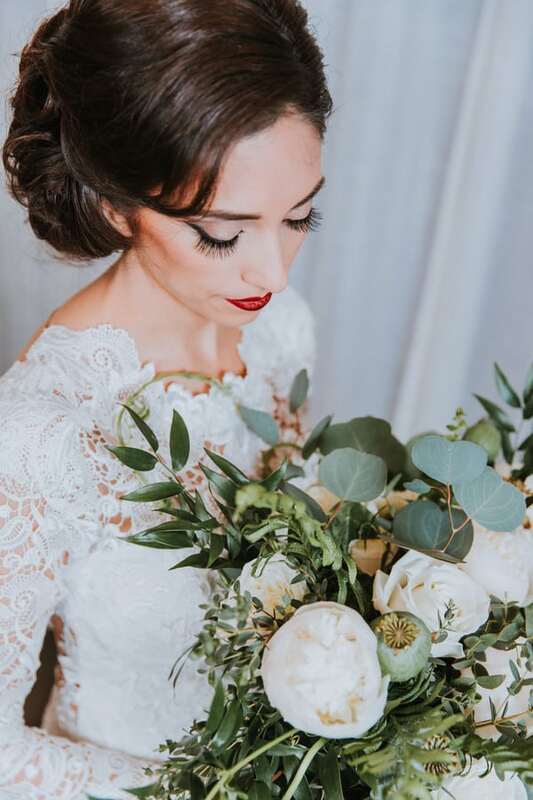 Her old world European look was completed with side-swept curls, a deep red lip and modern bouquet detailed with a music note ribbon. 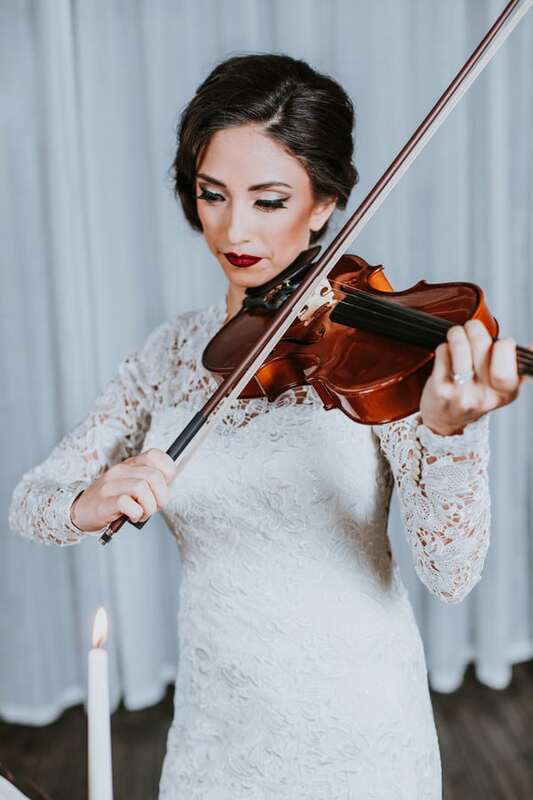 Place The Wedding Therapist’s own violin in her arms and an antique music stand next to her and voila: a scene filled with emotion, beauty, and love.